Transportation to trailhead and return to Banff/Canmore. Transportation of duffel to and from camp. Tent accommodation suitable for 3 to 4 persons. Knee-high cot with 3-inch foam mattress. Hot water, wash basins and pit privies. Two course breakfast and three course supper, plus nourishing trail lunch. Dining shelter in camp. Camp staff - including Host, Chief Leader, Musician and Health-Care Personnel. Evening campfire program and snack. Warm sleeping bag, liner and ground sheet (nights can drop to below freezing). Sturdy hiking boots - waterproofed and well broken in, plus several pairs of light and heavy socks. Rubber boots and casual shoes for around camp. Hiking pack for the day's necessities - including water bottle and extra clothing. 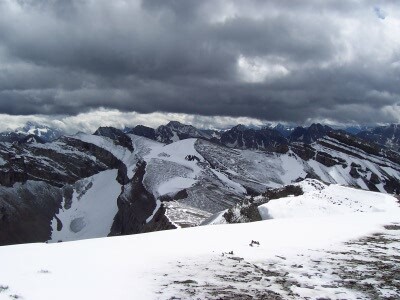 Clothing - layering is recommended for comfort in extremes of mountain weather (e.g. everything from shorts to a sweater and winter jacket). Personal toiletries - including insect repellent, biodegradable soap, towels and sun protection. Click here to see a recommended list of items to bring. How should my gear be packed? Personal gear must be packed in individual, sturdy, well-tied duffel bags (maximum size approximately 36"x15"x15"). Limit 1 bag per person including sleeping bag. Pack articles in plastic to keep them dry. Breakable items should be padded to prevent damage. Photographic equipment, binoculars or other valuables MUST NOT be packed in duffel. Your bags will be transported to and from camp by truck or pack horses over rough mountain terrain. 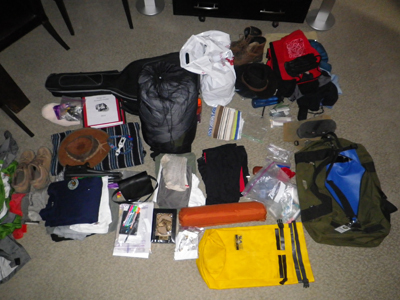 THE ORGANIZATION AND OUTFITTER WILL NOT BE RESONSIBLE FOR DAMAGE TO OR LOSS OF PERSONAL GEAR. How are tent assignments made? Skyline Hikers utilizes prospector-type canvas tents that can accommodate up to four adults. To minimize the foot-print of the camp and its impact on the environment, tent utliization is optimized. Participants have the option to select their tent mates. The is to be done at time of submitting registration by filling in the appropriate section on the form. For those participants who have not self-selected tent mates, the camp host/hostess will make the tent assignment. You will be informed at time of check-in. Skyline Hikers cannot accommodate requests for single-person occupancy of a tent. No personal tents are permitted. Potable (drinking) fresh water supply for the camp is provided via an on-demand Katadyne filter. Water supply for cooking and kitchen use is provided via a separate filter system. This water is to be used by kitchen staff only and should not be used for drinking water. Water samples taken from the filter systems is tested by a lab in Calgary to verify that no pathogens are present. The lab report is posted in the dining tent. NOTE that the water in the streams in the mountains is usually unsafe to drink because of the presence of Giardia bacteria (resulting in Giardiasis or "Beaver Fever" which is a serious medical condition). Do you handle special dietary requirements? Some special dietary needs may be accommodated. The camp is located at a remote site with limited food storage and handling facilities. Remember that this is a backcountry kitchen. If you are on a gluten-free, lactose-free or other diet, have allergies, diabetes, etc., please indicate that on your registration form so we can help you make an informed decision about whether the available food will meet your needs. It may go below freezing at night, and mornings and evenings in camp are cool, so a warm sleeping bag, layered clothing, gloves and hats are essential. Daytime temperatures are usually pleasant, but it can be cool and windy at high altitudes. Is SHCR membership required to attend camp? You are not required to be a SHCR member prior to registering to attend any one of the five camps held annually. When you register to attend a camp, membership is included as part of the package. Anyone 8 years and older are invited to participate in a SHCR camp. The SHCR encourages the participation of youth in wilderness camping and recreational hiking. Persons 8 - 17 years of age must be accompanied to camp with an adult (i.e., parent, grandparent, relative, etc.) The "Release of Responsibility" section on the camp registration form for these persons must be signed by their legal guardian. All persons participating in a SHCR camp must be in good health, have no mobility or mental impairments, and be capable of participating in program of daily hikes offered. The easiest hikes are between five and ten kilometers on mountain trails with some steep hills. If you are able to comfortably hike a similar distance on your local trails you should be okay. When do we meet in Banff? Camp check-in is between 2:00 and 3:30 pm on the Sunday before the camp begins. Duffel bag is brought to the camp check-in. Keep in day-backpack any clothing, footwear and other articles you may need on hike into camp the following day (Monday). There will be a weight limit on your duffel – 42 pounds (19 kg). There is a camp orientation briefing from 4:30 to 6:30 pm on the Sunday at which the camp Chief Leader, Host/Hostess and Medic will provide guidance on the do's and do not's while in camp and on the trail. As well, logistics details will be provided for the trip on following day into camp. Do I need hotel reservations? Hotel reservations in Banff or Canmore, for Sunday night, must be made well in advance. Last minute accommodation is difficult, if not impossible, to obtain. Hikers return to Banff late Saturday afternoon and, depending on personal travel arrangements, may also require a hotel room for this night. These costs are not included in hike fees. Skyline Hikers has arranged a 15% discount if you book with one of the hotels managed by the Banff Lodging Company. Details here! Campgrounds and trailer drop-offs are available. Calgary International Airport is approximately 130 km east of Banff. Bus and limo services are available. Do I need a park entry permit for Banff? 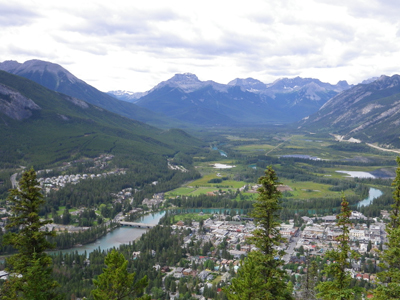 The Banff townsite is situated inside the boundaries of Banff National Park. The park entry permit fee is separate from the backcountry permit fee which is included in the camp fee you pay to Skyline Hikers. If you are driving to Banff you will require a park entry permit to cover the days your vehicle is inside Banff National Park, including those days that it is parked while you are in camp. If you are travelling to Banff using public transportation (e.g., intercity bus, airporter bus, etc.) the park entry fee is included in the price of your ticket. If you are staying in Canmore, you will to visit the Banff townsite for the Sunday check-in and orientation.